Northern blue-tongued skinks (Tiliqua scincoides intermedia) are the largest and heaviest of the blue-tongued lizards (family Scincidae, genus Tiliqua). They are native to Australia and found almost exclusively in the Northern Region. 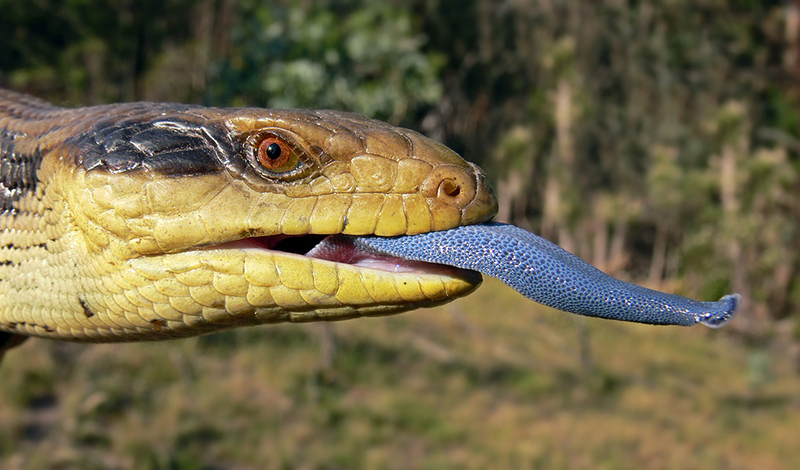 Blue-tongued skinks comprise the Australasian genus Tiliqua, which contains some of the largest members of the skink family (Scincidae). They are commonly called blue-tongued lizards or simply blue-tongues in Australia. As suggested by these common names, a prominent characteristic of the genus is a large blue tongue that can be bared as a bluff-warning to potential enemies. The northern blue-tongued skink (Tiliqua scincoides intermedia) is a subspecies of the eastern blue-tongued skink (T. s. scincoides). Similar to other blue-tongued lizards, the northern blue-tongued skink has very distinctive patterning. Northerns tend to be a bright orange to soft peachy orange or even a yellowish colour with darker stripes along their sides and backs, with a lighter, creamier colour on their bellies. As their name would suggest, they also have bright blue tongues often used to warn off or startle predators. Their legs are short and small compared to the length and width of their bodies. They can grow to approximately 24 in (61 cm) total length. They are diurnal [active during the day], ground-foraging omnivores, feeding on a wide variety of insects, gastropods, flowers, fruits and berries. They are viviparous, with litter sizes from five to twenty four in the northern blue-tongues. Click HERE for a Northern Blue Tongued Skink care sheet.